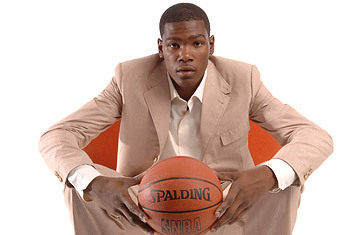 Kevin Durant, the spindly, silky-smooth forward from the University of Texas, is making life miserable for the Portland Trail Blazers, who hold the first overall pick in tonight's NBA draft. Hoops history tells the Blazers to take the big man, Ohio State seven-footer Greg Oden, since dominant post-players like Bill Russell, Shaquille O'Neal and Tim Duncan collect the championship rings. But Durant, a 6-ft. 10-in. scoring machine who became the first freshman to ever win college player-of-the-year honors, has looked more impressive in pre-draft workouts. Durant sat down with TIME's Sean Gregory to discuss the draft, a taskmaster parent, and the doubters that drive him. TIME: There are already tremendous expectations that you and Greg Oden will be all-time great players. Are you feeling the pressure? Kevin Durant: There's a lot of hype. People are saying we're going to be saviors wherever we go. I try not to think about it, and tell myself that 'I'm going to the NBA.' I'm not going to be the only person on my team that's good. There are going to be 10, 11 other guys that are great players like myself. So that takes a lot of the pressure off myself as well. TIME: Do you think it's fair that people have already put this burden on you and Greg? Kevin Durant: When they say "savior," that's a big-time word to use. But I guess it's an honor. I know I'll continue to work hard to be one of the great players in the NBA. That's the most I can offer right now. TIME: Growing up you had a coach, Taras ("Stink") Brown, who wouldn't let you play pickup games with your friends. Instead, he insisted that you do dribbling drills, and sprint up a steep hill near your DC-area home. How did you feel about that? Kevin Durant: It was tough. I didn't like it at all, I wanted to play with my friends. He told me that I would pick up bad habits by playing 5-on-5, so everyday I just did the drill work. It was like boot camp everyday. It made me cry all the timeI just told myself not to be a quitter. TIME: What was the worst part? Kevin Durant: The hill was the worst by far. No matter how cold it was outside, no matter how hot it was, you had to run. It wasn't just 5 or 10 runsit was 75, sometimes 100. If my mother came out there, she would double it. If it was 100, it would be 200.